Future Fisherman Foundation Annual Auction Begins November 26 with the Biggest Selection Ever! SPRINGFIELD, Mo. (Jan. 12, 2018) – Lew’s and the Future Fisherman Foundation (F3) are pleased to announce that the Lew’s High School Product Grant Program is now open to receive online applications for 2018 initiatives. Nearly 100 high school fishing clubs across the country took advantage of the program launched last year for the purpose of helping organized teen groups grow their memberships, get involved in community activities and promote conservation awareness. 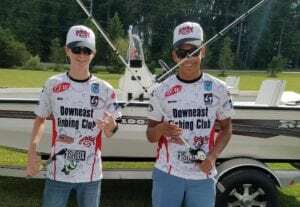 Downeast Fishing Club members Nick Stox (left) and Dorien Scott hold combos awarded through the Lew’s High School Product Grant program. The D.H. Conley High School fishing group, Greenville, N.C., used the gear for angler recruitment and fundraisers. Officials at F3, a well-known non-profit organization dedicated to youth fishing, liked what they saw in the program’s inaugural season and said year two is off to a fast start. There are three product award levels – 4, 8 or 12 Mach rod and reel combos, split equally between baitcast and spinning – with application approvals and combos awarded according to club size, activities and conservation involvement. Lew’s funds the product grant program by earmarking a portion of the sales of its Mach rods, reels and combos to support the effort. “We planned to award up to 1,000 combos for 2017 and we awarded right at that number, but we’re looking to grow it this year,” said Lew’s Senior Vice President of Marketing David May. “Our company has always been committed to giving back to our industry and I can’t think of any group more important to the future of this sport than America’s youth. Fishing builds confidence and character, and Lew’s is pleased to lead this program,” he said. Any U.S. high school fishing club or team is eligible to apply online between Jan. 1 and Sept. 30, 2018. However, clubs are encouraged to apply early because the application opportunity will close before Sept. 30 if the product allocation is met before then. For Lew’s High School Product Grant Program details, including the online application form, visit Lews.com and Futurefisherman.org. The Osceola Anglers Fishing Club of St. Cloud, Fla., is one of nearly 100 high school groups across the nation to benefit in 2017 from the Lew’s High School Product Grant program that awards rods and reels through an online application process for use in club recruitment, fundraisers and conservation awareness.